Spring/Summer16 saw some of the essential wardrobe staples on the catwalk. Not only did we see stripes, we saw the basic white t-shirt, tailored trousers and blazers popping up among many of the designer collections. But it was the white shirt that stuck out, except it wasn't your typical classic white shirt, it came with a twist. 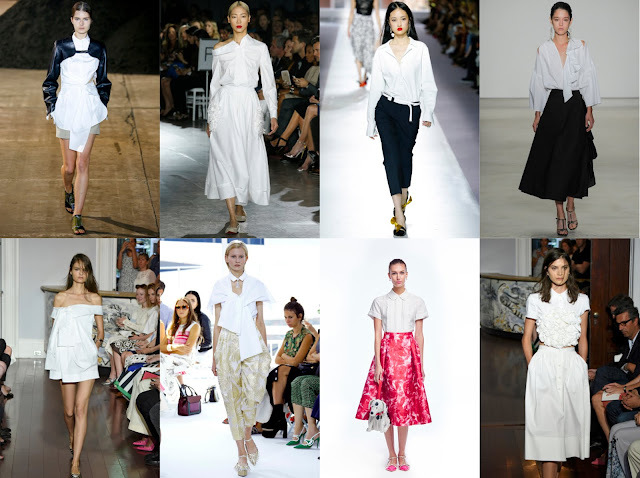 The white shirts were reformed with bell sleeves, tie details, ruffles and frills, making it popular than ever for the coming season. Our trusty simple button-down shirts will never let us down as it's timeless and versatile, but it's time to try something new! If you can't part from your standard white shirts, try buying something similar to the above, all classic white shirts, but the sleeves make all the difference making it stand out compared to your usual white shirt. 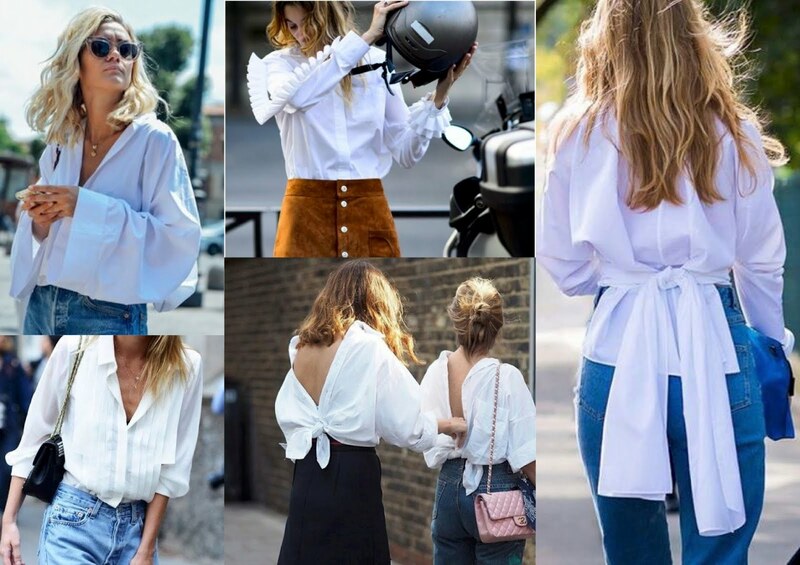 If you want a bit more interest to your shirt, try frills, ruffles or an off the shoulder style similar to the Marks and Spencer blouse from my previous post on SS16 Trends. 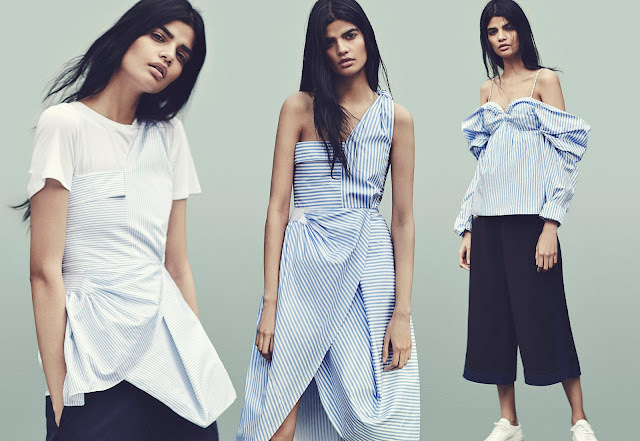 If your budget stretches you to high-end, J.W Anderson will be launching a six-piece capsule shirting line on February 17th, exclusively to Net-a-Porter. The line is designed in classic white and blue pinstripes, offering a contemporary twist to the classic wardrobe staples, which will be perfect for this coming season. Sarah Rutson, Vice President of Global buying at Net-a-Porter said: "The shirt is a fundamental backbone of most women's wardrobe"(Source: Vogue), and I must admit, it doesn't matter if it's a classic white or printed shirt, shirts are essential in my wardrobe. 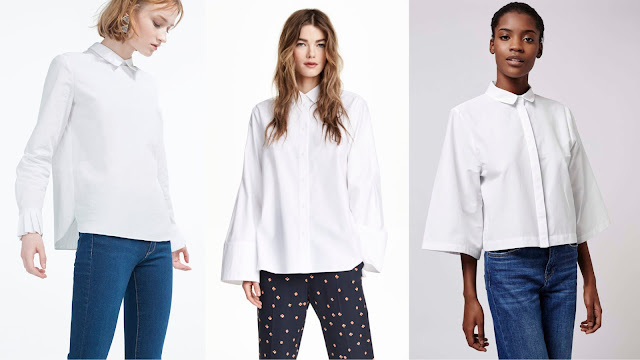 If you're feeling a bit adventurous try styling your shirt yourself in different ways, I came across a blog called Afterdark, and the girls managed to dress a classic oversized shirt in 5 ways, impressive! What will your twist be to your white shirt?